It’s clearly documented that Thompson Maxwell (1742-1831) spent time in the colonial army at the end of the French and Indian War, in the Continental Army, and in the U.S. Army during the War of 1812. Born in Massachusetts and living in New Hampshire when the Revolution began, he moved out to Michigan before his death. 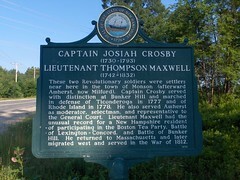 In the early nineteenth century, Maxwell began telling people that he was also a participant in the Boston Tea Party. I’ve puzzled over his descriptions of the event for years; in some ways they don’t make sense, but in other ways he appears to have had inside knowledge. In ’73 I went with my team to Boston with a load of stores for the poor of the town, which at that time was shut up. I had loaded at John Hancock’s warehouse & was about to leave town, when Mr. Hancock requested me to drive my team up into his yard, and ordered his servants to take care of it, & requested me to be on Long Wharf at two o’clock, P.M., & informed me what was to be done. I went accordingly, joined the band under one Captain Hewes; we mounted the Ships, & made Tea in a trice. This done I took my team & went home, as an honest man should. Maxwell thus appears to have named George Robert Twelves Hewes as a prominent participant over a decade before the book A Retrospect of the Tea Party made him a celebrity. Yet he also referred to “Long Wharf at two o’clock, P.M.,” which was neither the place nor the time of the Tea Party. In 1773, December 16, was in Boston, when the tea was thrown overboard. Seventy-three spirited citizen volunteers, in the costume of Indians, in defiance of Royal authority, accomplished this daring exploit. John Hancock was then a merchant. My team was loaded at his store near Faneuil Hall, for Amherst, N.H., and put up to meet in consultation at his house at 2 o’clock P.M. The business was soon planned and executed. The patriots triumphed. That account is more circumspect about what Maxwell actually did in the Tea Party. He used the passive voice and the plural instead of claiming directly that he was involved. But it’s much the same story, and liars’ stories don’t usually get worse over the years. He was looked upon in the neighborhood with a good deal of veneration, from the fact that he was a revolutionary, and from the further fact that he was one of the forty or fifty men selected by John Hancock to dress in Indian costume and to throw the tea overboard in Boston harbor, in 1773. . . . The people, encouraged by Samuel Adams, John Hancock, and other prominent men, were resolute in their purpose that the tea should not be landed. One ship owner by the name of Retch, had promised that he would take his tea back to England, but he dallied along for some days, and finally said he could not get a clearance for his ship. On the last day of grace, the people were assembled to the number of about seven thousand, not knowing exactly what to do; and the excited assembly continued together till after dark. This was on Thursday, the 16th day of December, 1773, just one hundred years ago. John Hancock had organized a body of men, who in the disguise of Indians were to board the ships and destroy the tea. The matter was understood between him and Samuel Adams, probably. There is no public record of the fact that this thing was arranged by Mr. Hancock, for it was a profound secret; but Major Maxwell stated that it was so, and that he was one of the men selected by Mr. Hancock for that purpose. As Pilcher noted, no other source says that Hancock was so involved in organizing the Tea Party, or any other street actions for that matter. As a prominent merchant, Hancock had lots of reasons to keep a low profile on illegal activities and a high profile at the Old South Meeting-house, away from the docks. Why on earth would he ask a teamster who happened to show up that day from New Hampshire to participate in a top-secret operation? Yet again, this account includes details that ring true: the behavior of shipowner Francis Rotch, apparently remembered as “Retch,” and the massive meeting. But how would Maxwell know about that meeting “till after dark” if he was at Long Wharf at two o’clock? It seems most likely to me that Thompson Maxwell was in Boston on 16 Dec 1773 but was a spectator who picked up some inside gossip, not a participant in destroying the tea. The accounts quoted above were published in the Essex Institute Historical Collections, the New England Historic and Genealogical Register, and the Pioneer Collections of Michigan. Pilcher wrote a similar profile of Maxwell in his 1878 book Protestantism in Michigan. Your conclusions, based on the documentary evidence, are probably right - but the more exciting story doesn't strike me as implausible. Maxwell arrives with goods for the beleaguered residents of Boston, and delivers them to the warehouse of a leading patriot; perhaps he expresses a wish that he could do more. Hancock invites his fellow patriot, a young, strong man entrusted with this mission, to the planning meeting (beyond which JH will keep his distance from the raid). And so on from there. In that light, a key question is whether we can in any way document Maxwell's original mission. If he was in Boston for the reason cited, then other parts of the story become much more likely. Maxwell’s errand to Boston is actually one of the dubious aspects of his story. In the first quotation above, he describes bringing “a load of stores for the poor of the town, which at that time was shut up.” But the British government didn’t shut the port of Boston until after the Tea Party, as a response to it. We could let that pass as confusion from many decades later, but details add up, especially when the burden of proof is on Maxwell. Interestingly, in both the first two quotes Maxwell described loading his wagon at Hancock’s warehouse, suggesting that he moved goods out of town—more likely when the port was open. Given the paranoid aspect of the conflict, I can’t see Hancock or other activists inviting Maxwell into the destruction of the tea unless they knew and trusted him completely already. And none of the stories indicate that they had a reason to do so. 1. This is most likely a family stretch but Thompson Maxwell sister in law was Bridgett Munroe (from Lexington and married to Hugh Maxwell). Bridgett Munroe's sister Lucy married just a few days before the Tea Party Samuel Hobbs (who also participated in the tea party). So he had another extended family member participating. 2. Then in "April 1775 he was again in Boston with his team and went out to Bedford to join the minute men" with his brother in law." I guess he picked important days to make deliveries to Boston. My general comments is you have to question the man's motivation for making up a story. He fought in Rogers Rangers during the FIW, was in Pontiac Rebellion, American Revolution, and War of 1812. He was certainly well known during the day to men of merit. One biographer describes "In 1818 Major Maxwell then seventy six years of age made a horseback tour from Detroit then his home to New England and back for the sole purpose of revisit ing the scenes of his early exploits He died about 1830 aged some eigkty eigbt years and reported to have fought in twenty two desperate battles." One would raise the question to why such a man would lie about this point. Of course that is an impossible question to answer. Nice blog posting on the issue. 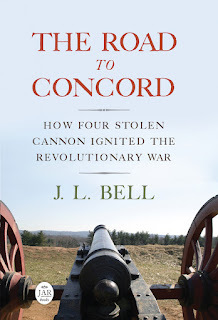 Contemporaneous documents put the Maxwell brothers and their in-laws in the Battle of Lexington and Concord, the Battle of Bunker Hill, and the siege of Boston. So there’s no question the family was part of the war. There’s also a curious document in Thompson Maxwell’s pension application in which his supporters apologize for false claims and ask for lenience because his memory was fading. Unfortunately, that document doesn’t specify the false claims, and the supporting documents don’t seem to be there. During the War of 1812, Maxwell got caught in the surrender of Detroit, and was even mobbed in Ohio by angry Americans. So there was one push to solidify his patriotic credentials. You’re right that Maxwell’s long service in the military shouldn’t have left much doubt about his participation in building the U.S. of A. But if the Tea Party became the litmus test for being a Massachusetts Patriot, and Maxwell had tied his self-image to that role, then he might have felt a tug to putting himself there as well. As I say, I’ve puzzled over Thompson Maxwell for years. Your posting encouraged me to read more of his pension application (I normally focus on Page 2 and 3 as that is the meaty stuff and I missed all the other pages). Francis Parkman in Montcalm and Wolfe also questions an account from the French and Indian War of Thompson Maxwell. But was the life "enhanced" for some reason? I see cause for your question. I got into this research through Hugh Maxwell and I think I will be continuing it for a while if anyone wishes to chat or share. Thanks for the analysis of the Saratoga stories. Some of Thompson Maxwell’s memoirs have a real ring of truth, as in the "hurry up and wait" of military life and the resentment of the mob after Detroit. Alongside those, his statements about the Boston Tea Party and other celebrated events seem improbable and overly dramatized. Yet he drops Hewes's name, which hadn't been part of the legend before. It's maddening! As I recall, many of the stories about older brother Hugh come through his daughter's book rather than words attributed to him. That means they may be less reliable, but there's also an easier explanation for any discrepancies. People took down Thompson Maxwell's Revolutionary stories in the late 1810s and later, after he had been (probably unjustly) accused of treachery in the surrender of Detroit and lost some property. For much of his recent career he had been out west, where there weren't so many veterans to contradict him. His stories don't survive in his own writing, particularly contemporaneous; people wrote down the stories he told. Nevertheless, as I've written repeatedly, there's plenty of documentation about Maxwell's military service starting in the French & Indian War when he was a teenager. By coincidence, today's posting is about his involvement in the Battle of Bunker Hill. Though there's no corroboration for some of the details in his story, there are contemporaneous documents for his presence. So the question is whether Thompson Maxwell over time let his stories stretch to put him in the Boston Tea Party, at the Saratoga surrender, or in other celebrated events. I'm researching a particular incident that occurred in Sept. 1779 on the Sullivan Expedition. It's well-documented by several of the officer's journals that an old woman was found at Catherine's Town on or about Sept. 1 (several write about it Sept 2). In Maxwell's memoir, he explicitly claims to have saved the old woman. [Speaking of the Battle of Newtown] We had a severe fight, but beat the Indians & pursued them through a small Indian Village to Queen Catharine's Town, & found that deserted by all save one.— The Queen alone was left & she too old to get away. She was sitting in the door of her hut, her head perfectly white with old age. I was in front, and stood & gazed on antiquity. An officer came up and took a gun to shoot her. I told him if he did I would shoot him next. Genl. Sullivan came up & approved of what I had done,— treated her kindly,— gave her everything she stood in want of, even to Rum,— gave her a protection and we went on. His claim that she was Queen Catharine Montour is spurious, and because of the other journals, I doubt his memory on the rest (though they did leave her provisions, there is no mention of leaving her rum…). Thanks for adding that to the discussion. The Maxwell brothers clearly seem to have been on the scene of a lot of notable events before, during, and after the Revolution. At the same time, the stories they told or were told about them seem to have gotten even more dramatic in the following years. The tough part is sorting out exactly what is reliable.